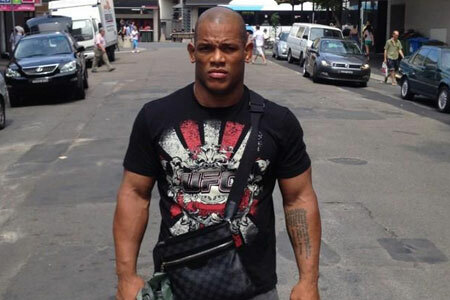 While most of the MMA world is busy chugging Matt Brown’s Kool-Aid like it’s the best thing in the history of ever, fellow UFC welterweight Hector Lombard (pictured) doesn’t understand what all the hoopla is about. “The Immortal’s” fans will claim Lombard is drinking a heavy dose of Haterade, but that hasn’t stopped the former Bellator champion from questioning Brown’s strength of schedule during his torrid seven-fight win streak. “Never fought a Former Champion or a top 10 guy and getting all the hype not impress by you @IamTheImmortal,” Lombard tweeted late Monday night. Sure sound like fighting words to me. In Brown’s last seven outings, six have ended via some form of knockout. However, it appears victories over Chris Cope, Stephen Thomson, Luis Ramos, Mike Swick, Jordan Mein, Mike Pyle and Erick Silva aren’t doing anything for Lombard. Lombard, meanwhile, has found new life since dropping from middleweight to the 170-pound division. With wins over Nate Marquardt and Jake Shields, “Lightning” thinks he’s inching closer towards a title shot and doesn’t believe Brown’s run is more impressive than his, given the level of competition. For what it’s worth – let’s be real, pretty much nothing – Brown is currently ranked #6 in the UFC welterweight division, one spot above Lombard. I guess there’s only one way to figure out who’s better, right?